Mr. Elliot Neff became a full time Upper School faculty member in 2018. 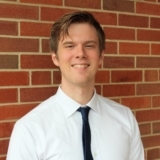 Elliot teaches Logic II, Medieval History and Literature, Intro to Philosophy, and Latin. He hails from the Lancaster area where he worked for the PA House of Representatives and attends One Life Church. Elliot graduated from Grove City College in 2016 with a major in Philosophy and minors in Classical Studies and Mandarin Chinese. In his free time, he enjoys traveling, reading, writing, playing board games, participating in sports and spending time with friends.